The MacBook's unibody will doubtless be copied by the PC fraternity. But will it be as good? Forget the fact for a minute that the new MacBook and MacBook Pros are the best-looking, most darn powerful laptops Apple has ever made. Wonder instead about how - and why - they made them look that way. To address power, performance, environmental concerns and good looks, Apple decided to come up with an entirely new process for making its laptops - and has incorporated some new technologies that should put them streets ahead of the competition. Here's how. 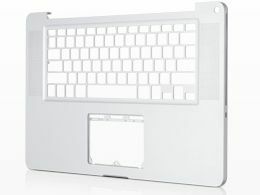 Like most laptops, Apple has been making its MacBook and MacBook Pros using three main parts - a bottom plate or case, an internal frame and top plate, effectively the palm rest. Making laptops thin enough, light enough and strong enough to withstand life on the road requires a lot of internal bracing, stiffening plates and so on. It makes laptops complicated to make and can lead to build quality problems. So Apple has been looking for a way to simplify the case design, to reduce the number of internal parts that up the frame and outer shell and, presumably to cut costs. When it launched the MacBook Air in January its palm rest comprises a single piece of aluminium - called the unibody - which is inherently rigid, strong and light. Apple is now applying what it's learned to the rest of its laptop line. The MacBook and MacBook Pro unibodies are again made from a single piece of aluminium, which is milled, drilled using Computer Numerically Controlled (CNC) machining, laser pierced and then anodised. You can see how the MacBook is made by watching the video at www.apple.com/uk/macbook. Apple's Senior Vice President for Design Jonathan Ive says of the process: "We have been so fanatical in the tolerances of how we design and machine these products." His boss, Steve Jobs, called it a "tour de force of engineering" at the laptop launch event on Tuesday. The result of the unibody construction is that the MacBook now ships with nearly 50 per cent fewer parts than the previous generation; while the MacBook Pro bests that by shedding 65 per cent of its parts. The result is that both the MacBook and MacBook Pro are simpler to make, helping to reduce build quality problems that have plagued Apple laptops of yore - remember tales of case warping, discoloured palm rests and the like? These should now be gone for good. Creating a unibody case for the MacBook and MacBook Pro isn't the only innovation on offer. Apple now sells both machines with glass LED-backlit displays and a glass trackpad. The benefits are obvious. As Apple has proved with the iPhone, glass makes perfect sense in a portable device - it helps make the device more rigid, cuts weight and is actually a lot tougher than you'd imagine. The glass trackpad is another tour de force - it enables you to carry out multi-touch gestures using up to four fingers, and won't be subject to same kinds of wear, tear and staining as traditional plastic trackpads. One of the benefits of using glass and aluminium during manufacture is that the new MacBook and MacBook Pro laptops are much greener than before - Apple says any aluminium 'wasted' during the manufacturing process can be instantly recycled and used again, while both glass and aluminium can easily be recycled at the products' end of life. Apple has also been able to strip toxic nasties like brominated fire retardants (BFRs), PVC, arsenic and mercury from the internal components. It has also been able to reduce the amount of packaging, enabling Apple to claim that it is cutting its carbon footprint too. Apple claims that the unibody is a 'major breakthrough' in the way laptops are made. It's hard to disagree. By cutting the number of parts, and simplifying the manufacturing process Apple has been able to create laptops that are light, strong and good to look at. It's obvious that it'll make laptops this away from now on. What's exciting though is what other uses Apple could put the unibody process to - from future iPods and iPhones to even desktops. And if the history of the PC industry is anything to go by, rival computer makers will now be racing to come up with their own versions, too.